Take advantage of our generous volume discounts by ordering $500 for 5%, $1,500 for 10% or $5,000 for 15%. Discounts are automatically extended at the checkout process. 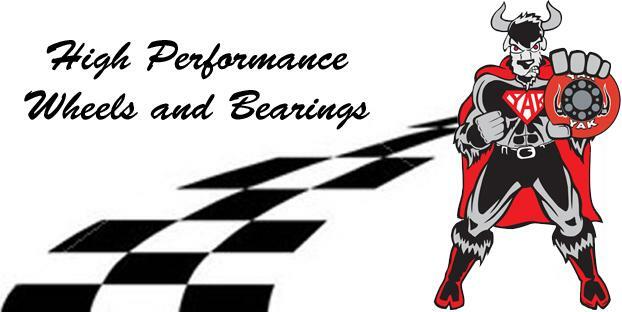 Welcome to your widest selection of wheels, bearings and accessories. Wholesale only - $250 minimum order. We do not sell retail, but Gordon does. Yakmaninoff now on Twitter and Facebook. Also check out Yakman's dance debut. "NOT A YAK? TAKE IT BACK!" Yak has offered the best prices on the highest performance wheels, bearings and accessories since 1990. Search long enough and find over 400 different wheels, bearings, boards, accessories. and enter your preferred diameter (in millimeters) and/or durometer. Or simply email us! 100mm x 85a low profile wheels, 79¢ each. See below. New wheel, new design, new specs, new level of performance, blows away everything you know about scooter wheels. Graphics both sides. 85a super high performance urethane gives better grip, better bounce, better roll. New hub design is unique and unlike anything you've ever seen. Need smaller quantities? Visit https://www.ebay.com/itm/132199938401. Overstock blowout of elected colors of our standard 100mm x 85a Low Profile urethane wheel. Classic, durable, Low Profile, high value scooter wheel. Rolling on millions of scooters worldwide. Seven colors to choose from. 200x50mm - strong, lightweight (less than 21 ozs. with bearings), 8" pneumatic tire w/5 spoke rim and 10mm I.D. bearings. Fits 15.5" mountainboard axle offered on our trucks page. 180mm YAK Noir High Performance truck. Compare to Randal. Good quality. Great value. Price per pair.